Dry Ice in Drinks: Is It Safe? Dry ice, which is actually carbon dioxide in its solid form, is quite popular at parties for its ability to produce bubbly wisps of "smoke." In fact, some drink recipes actually call for dry ice instead of the regular variety. However, people who are familiar with the product may be reluctant to include dry ice since they know that it is dangerously cold (-79 degrees Celsius, to be exact). 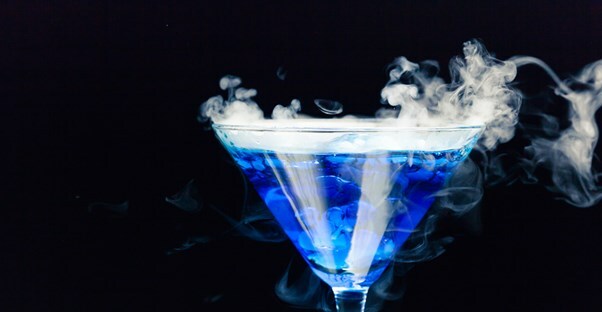 While this fear is understandable, including dry ice in drinks normally does not pose any risks to those who drink them. The only time dry ice could potentially create a problem is if someone was to actually ingest a piece of it. Because of this, you shouldn’t include it in individual glasses—instead place it directly in the punch bowl or large container that people will be ladling from. Additionally, be sure to use gloves when initially placing the dry ice to avoid burns. Most dry ice already comes packaged in a protective material, though, so gloves won’t always be necessary. Since dry ice is made of carbon dioxide, it does have the potential to slightly carbonate whatever beverage it’s placed in, but there’s absolutely no risk of poisoning from a drink that’s been cooled with it. Inhaling Helium: Is It Safe?